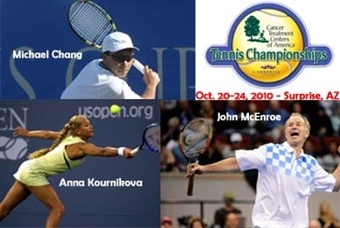 Men’s and women’s tennis stars will be out in force in October, as a host of former Grand Slam champions and top-ranked pros will make their way to Surprise Tennis & Racquet Complex, October 20-24 for the 2010 Cancer Treatment Centers of America Tennis Championships. Tennis legends and former world No. 1s John McEnroe and Jim Courier will join Michael Chang, Wayne Ferriera, Mark Philippoussis, Jimmy Arias, Aaron Krickstein and Mikael Pernfors to complete the eight-man field. Tennis pin-up and former WTA world No. 1 ranked doubles player Anna Kournikova is confirmed to appear and will join another marquee female player to be named later in a mixed doubles exhibition that will take place on Saturday, Oct. 23. This will be the third straight year this singles tournament of champions will be held in Surprise. McEnroe won the inaugural event in 2008, and last year Todd Martin triumphed over Andre Agassi. The CTCA event will have seven total sessions available for purchase, including night sessions on the first two days of the tournament, both day and night sessions on Friday Oct. 22 and Saturday Oct. 23. A single session on the final day - Third place and final - will be held at noon on Sunday, Oct. 24. Tickets can be purchased at the Surprise Tennis & Racquet Complex (14469 W. Paradise Lane, Surprise, AZ 85374). Event tickets can also be purchased at any Ticketmaster outlet (located at Macy’s, FYE and Fry’s Marketplace stores). A service charge will be applied to tickets purchased via Ticketmaster at outlets, by phone or online. To order by phone – call Ticketmaster at 1-800-745-3000. To order online go to www.ticketmaster.com . Individual session prices are $35 and $45 dollars (and will increase after Sept. 1, so get your tickets early!!!). Series packages (all 7 sessions) are available starting at $210. Ticket discounts and group packages available for groups of 20 or more. To order group packages or to inquire about hospitality packages, call (623) 222-2222. Sponsorship opportunities are available for the tournament as well. Please contact Julie Reid at (623) 222-2264 or Julie.Reid@surpriseaz.gov . 154 career titles, 17 Grand Slam titles (singles and doubles), former world No. 1 in singles and doubles. and member of the International Tennis Hall of Fame. 34 career titles and youngest-ever male Grand Slam Champion ever at the 1989 French Open (17 years, 3 months). Highest career singles ranking, No. 2. 29 career titles including 4 Grand Slams crowns (French Open 1991-92; Australian Open 1992-93). Former world No. 1, Davis Cup champion for United States and International Tennis Hall of Fame inductee (2005). 26 career titles and holds the male record for most consecutive Grand Slam appearances. Former Top 10 player who was a 2003 Wimbledon and 1998 US Open finalist, as well as the star of the reality TV dating show, Age of Love. Former Top 5 player in the world, US Open semifinalist and Italian Open winner in 1983. Arias is currently a commentator for the Tennis Channel. Former Top 10 player who recorded 9 career singles titles on the ATP Tour. Still holds the distinction of being the youngest-ever male player to win a singles title on the ATP Tour (16 years, 2 months). 1989 US Open semifinalist and 1995 Australian Open semifinalist. The Swedish backboard was a 1986 French Open Finalist and a two-time NCAA singles champion (1984-85) for University of Georgia.